The M1 is the latest news in IAME's production. 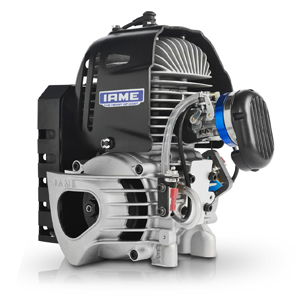 This small and compact 60cc power unit is designed to introduce the very youngest drivers to Karting and to make life as easy as possible to Dads and Mechanics. The M1 requires a very easy installation as all accessories are fixed on the engine block. The engine needs very low maintenence and basic service skills. It is provided with an easy and effective pull start system and a Tillotson diaphragm carburetor. The exhaust system stands with the engine and doesn't require the installation on the chassis. The simple 1.5l fuel tank completes the engine package. The M1 can be installed on 860/950mm wheelbase chassis. Safety is guaranteed by the cylinder/cylinder head and exhaust heat covers and a practical ON/OFF switch is located on the right side of the engine providing easy and immediate access to operators. The M1 is the power unit for the Drivers of the future and provides the perfect choice for Karting Trainers, Schools and Rental facilities. M1, the first step into Motorsport.